Rotek Series 2100 units are four-point contact slewing bearings with induction-hardened raceways. 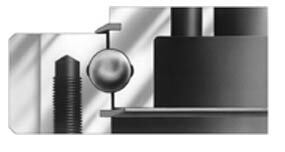 Balls are chrome-alloy steel and separated by spacers to prevent ball-to-ball sliding friction. Series 2100 units are general purpose slewing bearings for medium duty applications. Raceway Diameters: 13" to 57"